Bone Therapeutics is bringing a unique value proposition by developing a range of innovative cell therapy products administrable via a minimally invasive technique. Bone Therapeutics has developed an allogeneic off-the-shelf cell therapy platform, ALLOB, and an enhanced viscosupplement, JTA-004, which target 3 bone indications and offer the potential for additional product extensions. Bone Therapeutics is an advanced biotechnology company with a unique approach to the development of cell therapy products for orthopaedics and bone diseases. We are creating a new and unique treatment approach using differentiated bone-forming cells administered via a minimally invasive procedure. 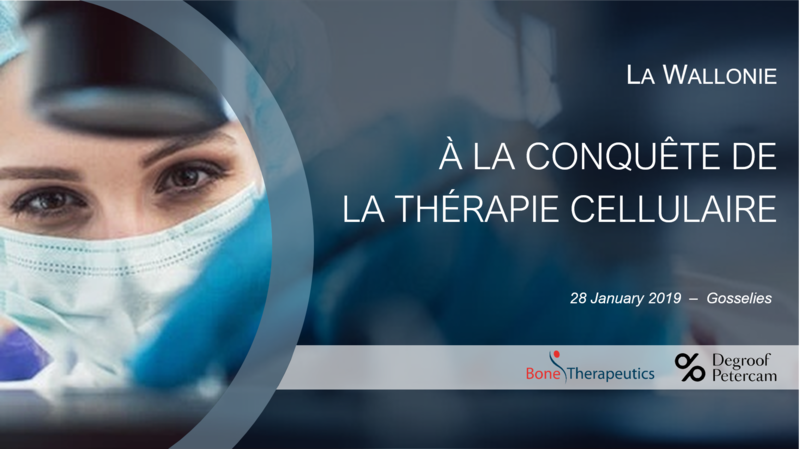 Bone Therapeutics is a bone cell therapy company specializing in addressing unmet medical needs in the field of orthopaedics and bone diseases. Bone Therapeutics has a broad portfolio of innovative allogeneic cell therapy solutions across a range of indications.